In partnership with the National Union of Health Workers of Guatemala (SNTSG) and Public Services Internacional (PSI), a global trade union federation representing 20 million workers who deliver public services in more than 160 countries. Guatemala has been going through an institutional crisis in recent months that has now become more acute. The Jimmy Morales government has systematically increased the persecution of community leaders, activists, journalists and trade unionists. 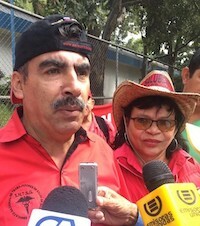 Luis Alpirez Guzmán, General Secretary of the National Union of Health Workers of Guatemala (SNTSG), and Dora Regina Ruano, from the same organization, were detained for nearly ten days (17-28 January) for negotiating and signing a collective agreement between the union and the Ministry of Health authorities back in 2013. The current government has accused them of ‘abuse of power’ because the ministry of health didn’t have enough money to pay for their obligations under the new collective agreement. Despite being released from prison, both union leaders remain under house arrest. SNTSG and PSI have launched an urgent campaign to demand that the Guatemalan government immediately drop all charges against Dora Regina Ruano and Luis Alpirez Guzmán and end repression against all community leaders, activists, journalists and trade unionists. You can help! Type in your name and email address, then click on 'Send Message' on the bottom of this page. Type in your message here - or just use the existing message. Would you like to receive future urgent action alerts from us? LabourStart takes your privacy very seriously. Read our privacy statement here.